It's that time of year again. Valentine's day is a day for concord, concurrence, and cordiality. This was seen in the statutory exchange of letters between chancellor of the exchequerGeorge Osborne and Mervyn King, governor of the Bank of England. "With external price pressures diminishing, and the underlying weakness in domestically generated inflation likely to persist, the Committee's assessment of the inflation outlook at its February meeting was that, in the absence of further policy action, the balance of risks around the inflation target in the medium term lay to the downside"....."The unwelcome combination of sluggish growth and high inflation over the past two years is a reflection of the need for the economy to rebalance following the financial crisis and associated deep recession, together with rises in the costs of energy and imports. Although inflation is now falling broadly as expected, the process of rebalancing still has a long way to go"
"it was more likely than not that inflation would undershoot the 2% target. This is why I increased the ceiling of asset purchases financed by the issuance of central bank reserves from £275billion to £325billion"..."You have explained that the combination of sluggish growth and high inflation over the past two years is a reflection of the need for the economy to rebalance following the financial crisis and associated deep recession.....the process of rebalancing has a long way to go. I note and agree with this analysis"
a) Inflation is in danger of falling too low! 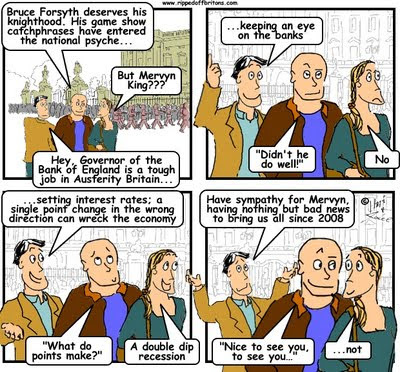 To devalue money, and push inflation up a bit, £50billion has been printed and handed to the banks. b) Sluggish growth and high inflation is needed to rebalance the economy. c) Sluggish growth and high inflation is going to continue for a long time. Nice to see they get along. But what about the rest of us?